Assignment of side-chain hydrogen atoms using double-resonance spectra, only, may not always be possible with complete unambiguity. The easiest spectrum to use is the 15N-TOCSY-HSQC, as this should show all side-chain hydrogen resonances for any given NH group. 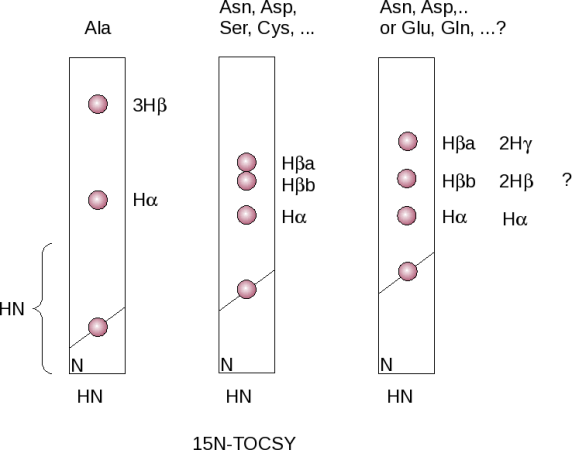 However, in many cases not all side-chain resonances may be visible, or for certain amino acid types it may not be possible to assign the resonances to particular side-chain groups. In particular it may in some cases be difficult to distinguish between Hβ and Hγ atoms and it may not always be possible to work out whether mythylene groups are degenerate or not.